applied to more content driven pages minus the large headlining sections. project and current site, and other "artwork" which I created myself. project, optimization, and integration with the application itself. links are currently nonfunctional as they were taken from the current site. It is solid and it looks like it'll be easy to integrate into CMS/md. > applied to more content driven pages minus the large headlining sections. > project and current site, and other "artwork" which I created myself. > project, optimization, and integration with the application itself. > links are currently nonfunctional as they were taken from the current site. > It is solid and it looks like it'll be easy to integrate into CMS/md. > 'nifi-banner.xcf' is the raw? > > applied to more content driven pages minus the large headlining sections. > > project and current site, and other "artwork" which I created myself. > > to the site. > > project, optimization, and integration with the application itself. > Thank Bootstrap for those! > > It is solid and it looks like it'll be easy to integrate into CMS/md. > > 'nifi-banner.xcf' is the raw? > > > project and current site, and other "artwork" which I created myself. > > > to the site. > > > project, optimization, and integration with the application itself. > > > a copy of this design hosted at http://aldrinpiri.com/apache-nifi/. so anyone else can come along and make non-lossy changes to the images/etc. >> It is solid and it looks like it'll be easy to integrate into CMS/md. >> 'nifi-banner.xcf' is the raw? >>> applied to more content driven pages minus the large headlining sections. >>> project and current site, and other "artwork" which I created myself. >>> project, optimization, and integration with the application itself. You've got my +1. I think you've done a great job here, Aldrin! doesn't try to be anything more than what it is. come up with myself. I'd vote for keeping with bootstrap. utilitarian websites. I think it is "trying too hard". looking like the .com one, IMO. black swooshy things distracting me. > doesn't try to be anything more than what it is. > down with this look. keep iterating as folks have time, willingness, and expertise to do so. need. We need it laid out in a way that multiple folks can contribute. the Apache Way and grow then perhaps branding becomes a bigger deal. with the expertise and willingness to contribute in this space. > keep iterating as folks have time, willingness, and expertise to do so. > need. We need it laid out in a way that multiple folks can contribute. > the Apache Way and grow then perhaps branding becomes a bigger deal. >> doesn't try to be anything more than what it is. >> down with this look. >> > project and current site, and other "artwork" which I created myself. >> > to the site. >> > project, optimization, and integration with the application itself. contained all the information expected of an apache process. don't know how I feel. > with the expertise and willingness to contribute in this space. > > keep iterating as folks have time, willingness, and expertise to do so. > > need. We need it laid out in a way that multiple folks can contribute. > > the Apache Way and grow then perhaps branding becomes a bigger deal. > >> doesn't try to be anything more than what it is. > >> down with this look. > >> > project and current site, and other "artwork" which I created myself. > >> > to the site. > >> > project, optimization, and integration with the application itself. > >> > a copy of this design hosted at http://aldrinpiri.com/apache-nifi/. > contained all the information expected of an apache process. > don't know how I feel. >> with the expertise and willingness to contribute in this space. >> > keep iterating as folks have time, willingness, and expertise to do so. >> > need. We need it laid out in a way that multiple folks can contribute. >> > the Apache Way and grow then perhaps branding becomes a bigger deal. >> >> doesn't try to be anything more than what it is. >> >> down with this look. >> >> > project and current site, and other "artwork" which I created myself. >> >> > to the site. >> >> > project, optimization, and integration with the application itself. >> >> > a copy of this design hosted at http://aldrinpiri.com/apache-nifi/. hours ago and it has yet to appear, so I'm sending again. converging and users have the instant familiarity of a known quantity. thankful for some guidance on that front and do my best to provide it. content through a tiny screen is accustomed. okay, but I definitely hedged as to whether or not to include it. where possible to give a face to the project. something that can automate this tedium and make them more effective. too loud. It could definitely deal with being muted a bit more. the colors from the UI itself. > hours ago and it has yet to appear, so I'm sending again. > converging and users have the instant familiarity of a known quantity. > thankful for some guidance on that front and do my best to provide it. > content through a tiny screen is accustomed. > okay, but I definitely hedged as to whether or not to include it. > where possible to give a face to the project. > something that can automate this tedium and make them more effective. > too loud. It could definitely deal with being muted a bit more. >> contained all the information expected of an apache process. >> don't know how I feel. >>> with the expertise and willingness to contribute in this space. >>> > keep iterating as folks have time, willingness, and expertise to do so. >>> > need. We need it laid out in a way that multiple folks can contribute. >>> > the Apache Way and grow then perhaps branding becomes a bigger deal. >>> >> doesn't try to be anything more than what it is. >>> >> down with this look. >>> >> > project and current site, and other "artwork" which I created myself. >>> >> > to the site. >>> >> > project, optimization, and integration with the application itself. >>> >> > a copy of this design hosted at http://aldrinpiri.com/apache-nifi/. > the colors from the UI itself. > > hours ago and it has yet to appear, so I'm sending again. > > converging and users have the instant familiarity of a known quantity. > > thankful for some guidance on that front and do my best to provide it. > > content through a tiny screen is accustomed. > > okay, but I definitely hedged as to whether or not to include it. > > where possible to give a face to the project. > > something that can automate this tedium and make them more effective. > > too loud. It could definitely deal with being muted a bit more. > >> contained all the information expected of an apache process. > >> don't know how I feel. > >>> spectrum have merit. > >>> with the expertise and willingness to contribute in this space. > >>> > the Apache Way and grow then perhaps branding becomes a bigger deal. > >>> >> doesn't try to be anything more than what it is. > >>> >> down with this look. > >>> >> > project. > >>> >> > to the site. > >>> >> > Thanks! 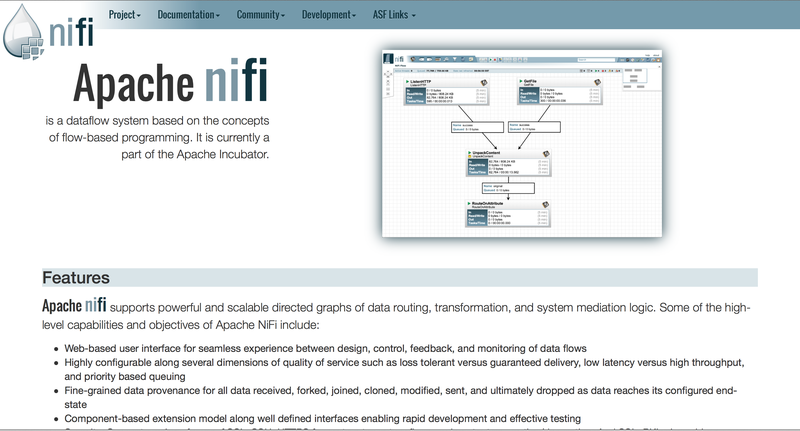 I'm not sure that I would include the NiFi logo on the right-hand side, since it's already in the top-left. From a NiFi 'brand' perspective, I would update the screenshot a bit. This screenshot is using the old logo in the top-left corner, and the graph shows all of the data disappearing before the RouteOnAttribute Processor. I'd recommend we construct a dataflow that's more appealing to the target audience, perhaps integrating with other Apache projects (HDFS, Kafka are possible, for instance) or using (S)FTP processor. Does it make sense to have maybe like a 'Latest News' section or something where we could post things like "Version 0.0.1 just released!" etc.? I'm really liking the concept - nice job! > > the colors from the UI itself. > > Any thoughts are appreciated. > > > hours ago and it has yet to appear, so I'm sending again. > > > converging and users have the instant familiarity of a known quantity. > > > thankful for some guidance on that front and do my best to provide it. > > > content through a tiny screen is accustomed. > > > okay, but I definitely hedged as to whether or not to include it. > > > where possible to give a face to the project. > > > something that can automate this tedium and make them more effective. > > > end users. > > > too loud. It could definitely deal with being muted a bit more. > > >> contained all the information expected of an apache process. > > >> don't know how I feel. > > >>> spectrum have merit. > > >>> with the expertise and willingness to contribute in this space. > > >>> > the Apache Way and grow then perhaps branding becomes a bigger deal. > > >>> >> doesn't try to be anything more than what it is. > > >>> >> down with this look. > > >>> >> > project. > > >>> >> sections. > > >>> >> > to the site. > > >>> >> site. > > >>> >> > Thanks! page" inclusion, as other pages would just have the top navbar. would be a good candidate. 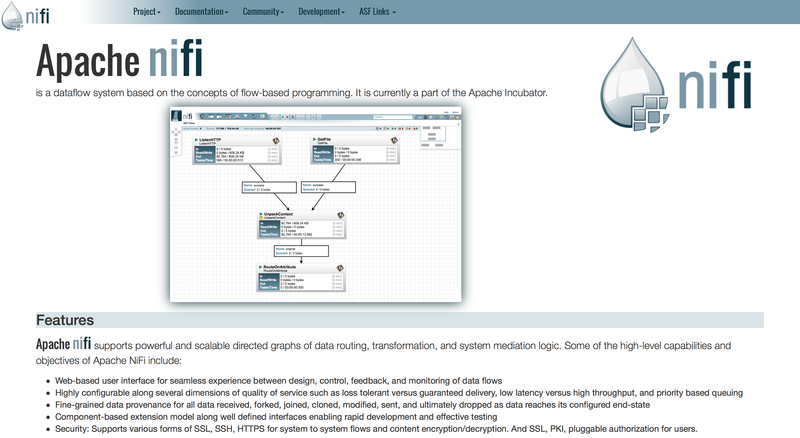 > I'm not sure that I would include the NiFi logo on the right-hand side, since it's already in the top-left. > From a NiFi 'brand' perspective, I would update the screenshot a bit. This screenshot is using the old logo in the top-left corner, and the graph shows all of the data disappearing before the RouteOnAttribute Processor. I'd recommend we construct a dataflow that's more appealing to the target audience, perhaps integrating with other Apache projects (HDFS, Kafka are possible, for instance) or using (S)FTP processor. > Does it make sense to have maybe like a 'Latest News' section or something where we could post things like "Version 0.0.1 just released!" etc.? > I'm really liking the concept - nice job! >> > the colors from the UI itself. >> > Any thoughts are appreciated. >> > > hours ago and it has yet to appear, so I'm sending again. >> > > converging and users have the instant familiarity of a known quantity. >> > > thankful for some guidance on that front and do my best to provide it. >> > > content through a tiny screen is accustomed. >> > > okay, but I definitely hedged as to whether or not to include it. >> > > where possible to give a face to the project. >> > > something that can automate this tedium and make them more effective. >> > > end users. >> > > too loud. It could definitely deal with being muted a bit more. >> > >> contained all the information expected of an apache process. >> > >> don't know how I feel. >> > >>> spectrum have merit. >> > >>> with the expertise and willingness to contribute in this space. >> > >>> > the Apache Way and grow then perhaps branding becomes a bigger deal. >> > >>> >> doesn't try to be anything more than what it is. >> > >>> >> down with this look. >> > >>> >> > project. >> > >>> >> sections. >> > >>> >> > to the site. >> > >>> >> site. >> > >>> >> > Thanks! > page" inclusion, as other pages would just have the top navbar. > in chronological order . > would be a good candidate. > since it's already in the top-left. > > From a NiFi 'brand' perspective, I would update the screenshot a bit. > shows all of the data disappearing before the RouteOnAttribute Processor. > possible, for instance) or using (S)FTP processor. > something where we could post things like "Version 0.0.1 just released!" > > I'm really liking the concept - nice job! > >> I like it. > >> > the colors from the UI itself. > >> > Any thoughts are appreciated. > >> > > hours ago and it has yet to appear, so I'm sending again. > >> > > work. > >> > > want an effortless experience; no pinch zooming, tap panning, etc. > >> > > content through a tiny screen is accustomed. > >> > > okay, but I definitely hedged as to whether or not to include it. > >> > > where possible to give a face to the project. > >> > > end users. > >> > > too loud. It could definitely deal with being muted a bit more. > >> > >> contained all the information expected of an apache process. > >> > >> seeing! > >> > >> dropdown. > >> > >> don't know how I feel. > >> > >>> needed. > >> > >>> spectrum have merit. > >> > >>> with the expertise and willingness to contribute in this space. > >> > >>> > Both are bootstrap based. Each is an iterative improvement. > >> > >>> >> doesn't try to be anything more than what it is. > >> > >>> >> down with this look. > >> > >>> >> > project. > >> > >>> >> sections. > >> > >>> >> > to the site. > >> > >>> >> site. > >> > >>> >> > Thanks! Maybe this is a little off topic, but I noticed that the logos consistently use "nifi" whereas in text its consistently written as "NiFi". Any reason for the difference? I kind of thing the logos look good as "nifi" and the text looks good as "NiFi" so I might be questioning something that I am OK with. But I noticed they are different and was wondering if this was a conscious decision or not. Thoughts? the logos look good as "nifi" and the text looks good as "NiFi"
> "NiFi". Any reason for the difference? > decision or not. Thoughts? > > Thanks for the comments. > > page" inclusion, as other pages would just have the top navbar. > > in chronological order . > > would be a good candidate. > > since it's already in the top-left. > > > From a NiFi 'brand' perspective, I would update the screenshot a bit. > > shows all of the data disappearing before the RouteOnAttribute Processor. > > possible, for instance) or using (S)FTP processor. > > something where we could post things like "Version 0.0.1 just released!" > > > I'm really liking the concept - nice job! > > >> I like it. > > >> > the colors from the UI itself. > > >> > Any thoughts are appreciated. > > >> > > hours ago and it has yet to appear, so I'm sending again. > > >> > > work. > > >> > > want an effortless experience; no pinch zooming, tap panning, etc. > > >> > > content through a tiny screen is accustomed. > > >> > > okay, but I definitely hedged as to whether or not to include it. > > >> > > where possible to give a face to the project. > > >> > > end users. > > >> > > too loud. It could definitely deal with being muted a bit more. > > >> > >> contained all the information expected of an apache process. > > >> > >> seeing! > > >> > >> dropdown. > > >> > >> don't know how I feel. > > >> > >>> needed. > > >> > >>> spectrum have merit. > > >> > >>> with the expertise and willingness to contribute in this space. > > >> > >>> > Both are bootstrap based. Each is an iterative improvement. > > >> > so. > > >> > contribute. > > >> > >>> >> I think the mockup looks like a very generic "bootstrap"
> > >> > >>> >> doesn't try to be anything more than what it is. > > >> > >>> >> down with this look. > > >> > >>> >> > project. > > >> > >>> >> sections. > > >> > myself. > > >> > >>> >> > to the site. > > >> > itself. > > >> > http://aldrinpiri.com/apache-nifi/. > > >> > >>> >> site. > > >> > >>> >> > Thanks!